In the market for some new kitchen countertops? It can be easy to go on aesthetics alone, but durability, cost, and other factors should help you in your decision. Read on for some things to consider when choosing your kitchen countertop! If you have young children who make a lot of mess, white granite might not be the best decision because it will show stains and the grooves can hold bacteria. Meanwhile, if you cook a lot, laminate may not be the best option because it can’t withstand high temperatures. It’s important to consider your lifestyle before making your decision! There is a plethora of countertop options that will undoubtedly complement your kitchen décor. Granite is the most popular, but there is also genetically-engineered stone which looks the same but is more durable. They run roughly the same price, but the engineered type is nearly bulletproof. Concrete countertops are also gaining popularity as you can alter how they appear to fit your vibe. 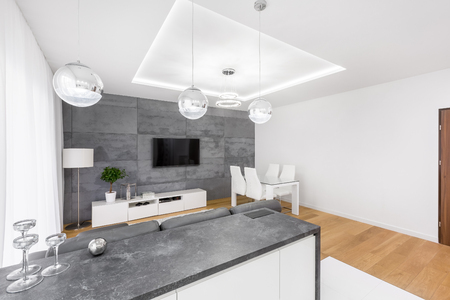 What’s great for homeowners today is that there are so many materials available that will satisfy your aesthetic at an array of price points. However, determining what your needs are is more important than saving a few bucks. There is a good variety in the market so working with a contractor you trust is important. Interested in discussing concrete countertops? At Templin Concrete Construction, we have an array of options to choose from. Call us at 612-388-1945 to speak with one of our experts today! Stained Countertop? Remove It with Ease!